The "Physics of Cancer" symposium will take place from October 4-6, 2017 in Leipzig, Germany, both at the Max Planck Institute for Evolutionary Anthropology (MPI) as well as at the Center for Biotechnology and Biomedicine (BBZ). All talk sessions will be in the auditory of the MPI (second floor), the poster session will be in the foyer of the BBZ. Our interactive map below shows the conference locations and important tram stops as well as sights and points of interest in Leipzig. You may also look up the conference location directly in Google Maps to get detailed directions. For more information on how to get to Leipzig, have a look on our travel information. 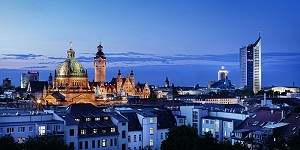 Leipzig is a vibrant metropolis in the heart of former East Germany. Its is well known for its cultural, especially musical, history and famous for its trade fairs and exhibitions. Leipzig played a significant role in the peaceful revolution of 1989, which led to the fall of the Berlin Wall and finally of communism in Eastern Europe. The University of Leipzig, being one of Europe's oldest universities, looks back to a long tradition. Many famous names, including Bach, Mendelssohn, Goethe, Lessing, Leibniz, Debye, Ostwald, Bloch, Hertz, and Heisenberg, are associated with Leipzig and its university. In 2010, Leipzig was included in the top 10 cities to visit by the New York Times. While you are in town attending the "Physics of Cancer" symposium, we hope that you will also find the time to see some highlights of Leipzig. The city offers many different sightseeing destinations and activities. On our interactive map, we marked some sights recommended for a visit. If you are interested, you may also have a look at the website of Leipzig's tourist information center.